If you’re a sports enthusiast who has cycled on the abandoned roads of the countryside, canoed in a creek, or even went out for a run on the shore of the beach, the notion of recording your activity and the landscaped vistas must have crossed your mind a couple of times. Being in the 21st century, this is now not only possible but is also something that has become a quotidian part of the lives of majority of the sportsmen. Thanks to the invention of the Action Cameras, one can archive their adventures simply by the touch of a button and strapping the camera to their helmet, arm, handlebar of the bicycle or anything convenient. 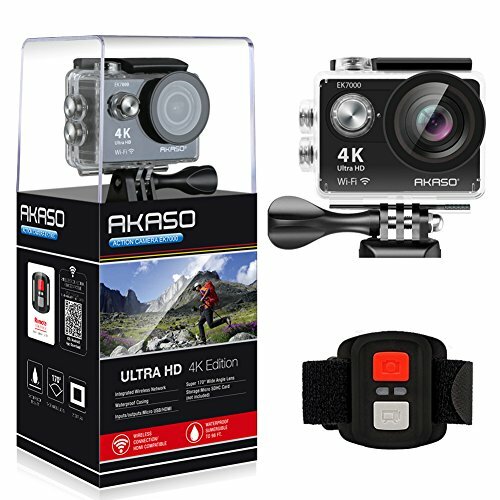 With the features of being portable, hands-free, waterproof and user-friendly, the action cameras are the new adored gadgets, shooting minimum 4K footage with fast frame rates and effortless footage. On the first place is the Campark ACT74, shooting 4K/30fps videos with a SONY sensor. It’s camera is at par with that of GoPro HERO7 being 16MP as well. The device is equipped with a 2 inch HD screen and what makes it stand out is that it comes with rechargeable lithium batteries that can last up to 180 minutes, so you can bid farewell to battery-depletion issues. 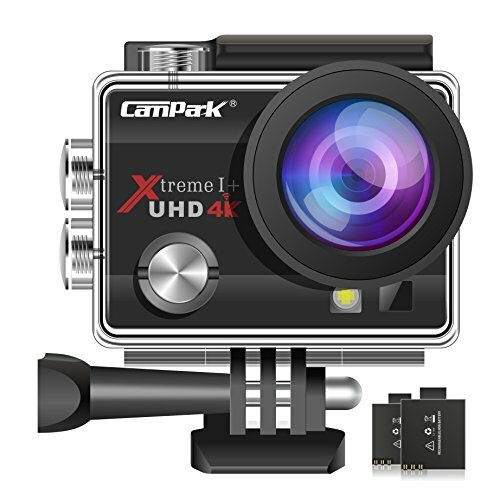 This camera supports a single micro SD card of up to 64GB maximum. The action camera can be controlled by WIFI remote controls that are compatible with both iOS and Android systems. The ACT74 is also resistant to water, it can be submerged into water till the depth of 30m and will still work effortlessly. The kits also comprises of a short wire strap, cable ties, wrists straps, camera enclosure and numerous mounting brackets. For the price, you really can’t go wrong with this camera. 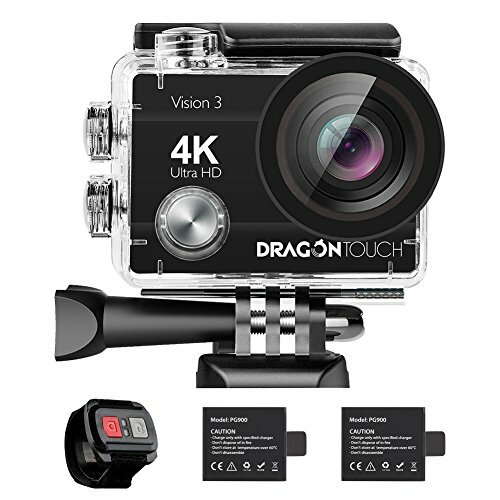 If you are low on budget, Dragon Touch 4K Action Camera is the one for you. But do not be deceived by the comparatively lower price, since Dragon Touch most definitely has NOT compromised on neither the inner circuit work, nor the external body. The 2-inch screen enables the users to view videos and photos recorded and captured respectively, in the most pleasing of ways. The 4K/30FPS, 2.7K/30fps, 1080P/60FPS video, and 16MP photo resolution is a treat, keeping the price in view. This camera also comes with a handy wireless wrist remote control. Want to share your moments and activities on your phone or tablet? No worries. The AXD app has you covered. The camera also comes with two batteries so power will be something you’ll be least bothered about. Oh, and did I mention that it comes with free mounting accessories kit? If this deal isn’t a no-brainer, I don’t know what is. Coming to the third best option out there; the traditional HD cameras have got nothing on this beast of a camera with its stunning 4K 25fps & 2.7K 30fps videos and 12MP photos at up to 30 fps which will give you a good run for your money. It has a very long battery life and comes with 2 rechargeable 1050mAh batteries, meaning each battery can record up to 90 minutes. The package is equipped with a wireless wrist remote control, providing you with a completely new approach for capturing photos. The EK7000 has built-in WIFI and HDMI that allows the user to instantly edit and share their moments with their loved ones. All you need to do is download the iSmart DV app which is available on both, AppStore and PlayStore. The mounting accessories are of course, complimentary. Recording videos and taking photos has never been easier. 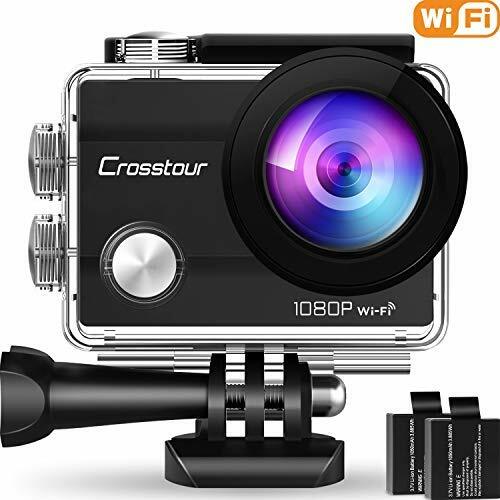 If you are running tight on budget but still want to own an action camera, then the Crosstour is most definitely what you’re looking for. The Crosstour Action Camera is famous for being the alternative of the costly GoPro Action Cameras, because it’s just as good and relevant. The 12MP and 1080P together can make sure you capture high-quality pictures and videos easily. The 2 inch HD screen makes the whole activity a lot more enjoyable. Crosstour is 30 meters water resistant; take notes swimmers. What makes this action camera unique is that it has a ‘Dash Mode’ which is usually absent in most cameras. This feature allows users to record perfectly stable videos while driving. ISmart DV is the app that is associated with the Crosstour, which is available on both the iOS and Android devices, this allows one to easily record videos, take photos, download/delete and view files. The camera also comes with two rechargeable 1050mAh lithium batteries that can last up to 3 hours, and a kit full of 18 multifunctional accessories. The only drawback of this beauty is that it lacks the ‘Time Lapse’ mode, but hey, do I need to remind you the beyond belief retail price of the device? You will NOT regret buying this action camera, you have our words on this. The EKEN H9R is so far the most underrated Action Camera in terms of popularity. With the ability to shoot videos of 4K at 25fps / 2.7K 30fps/ 1080p 60/30fps 720p/120fps, the EKEN H9R just can’t disappoint you. It captures photos up to 12 Megapixels. The device comes with built-in WiFi & HDMI output so editing and sharing your moments will be a child’s play, especially with the App EZ iCam, that has been specifically designed for this particular Action Camera. The EKEN H9R also comes with a distinctive feature, that is, ‘live streaming’. So you can go out for a hike and your family can monitor your every move right from the living room. But unfortunately, this feature is only available on the iOS devices. Also, the camera is packed with two 1050mAh batteries, giving you a long enough battery life to record your complete venture. And lastly, something that makes a product more exciting: the free accessories. I mean, who doesn’t like free stuff? 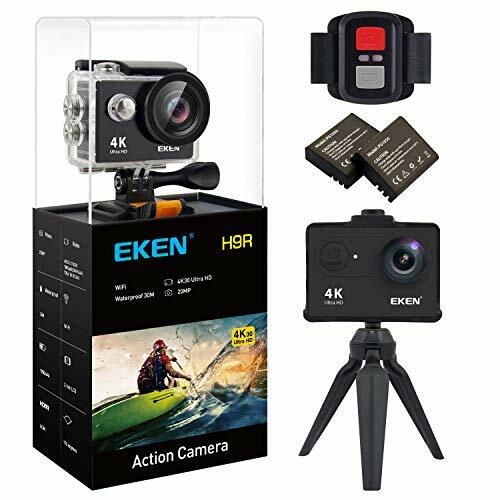 EKEN H9R comes with a waterproof housing, 2.4G remote, pole mounts, tripod, USB cable, charging dock and helmet mounts.